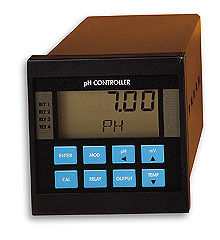 The PHCN-90 pH controller and ORCN-90 ORP controller are microprocessor-based panel meters with field installable plug-in cards for maximum flexibility. The isolated input cards allow for preamplfied pH or ORP sensor input, or any transmitter input (0-20 mA, 4-20 mA, 0-5 Vdc or 0-10 Vdc). The output cards plug into three sockets. Output sockets 1 and 2 accept any combination of analog cards; socket 2 accepts an analog or the dual proportional control card to provide either pulse outputs for up to two metering pumps, or two Hi/Lo on/off SPST 5 A relays. The third socket is dedicated to the PHOR-90-R2 dual 5 A , SPDT relay card. Both the PHOR-90-R2 relay cards feature independent settings for high or low operation, setpoints and hysteresis (deadband). Use no outputs for basic digital display, or fill anything from one to all three sockets and the software will automatically adjust to allow programming for only those option cards which are installed–makes setup, wiring, and function identification a snap! The front panel and internal circuit board slide forward for simple installation of the cards–without removing the unit from the panel. All calibration, scaling and setpoint inputs are done from the alphanumeric front panel display. 참고: Note: 4 to 20/0 to 20 mA cards—Max. loop resistance 425 ohms. 0 to 5 Vdc or 0 to 10 Vdc cards—Min. load resistance 1 kohm) Complete operators manual included.